Professor Kobré's Lightscoop | OhGizmo! By Andrew Liszewski on 05/28/08 • Leave a comment! I hate the look of my camera’s pop-up flash, and would rather carry a tripod around for use with long exposures in low-light conditions than have to use it. The other option of course is to carry a dedicated external flash, but that can be inconvenient and expensive. But it seems a Professor Kobré has created a cheap and simple alternative. 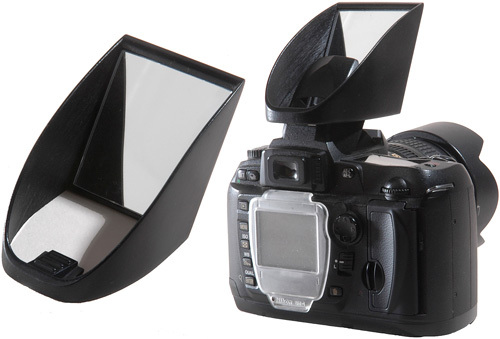 The Lightscoop slides onto your camera’s hot shoe and fits over the pop-up flash, bouncing the light towards a ceiling or wall using just a mirror. As a result your subject is illuminated by diffuse light which produces more natural results and even eliminates red eye or the ‘cave effect’ where the background ends up being underexposed. The Lightscoop can’t be used outdoors or in large venues like a church or stadium since it relies on a light-colored ceiling or wall to effectively bounce the light. But at just $34.95 it’s a ridiculously cheap way to vastly improve the quality of your photos. The Universal version of the Lightscoop is designed to fit SLRs from Canon, Nikon, Pentax, Sigma and Fuji, but you’ll want to make sure your particular model is supported before you order one.